Alabama, Georgia, and Florida probably don’t even have a restrictive law like the Pennsylvania Supreme Court just struck down, so local governments in the states along the proposed Sabal Trail, Florida Southeast Connection, and Transco Hillabee Expansion Project pipelines apparently can pass restrictions on pipelines. As can state legislatures. The energy industry and policy makers in Pennsylvania, the heart of the nation’s gas drilling boom, are thinking about their next moves after the state’s highest court threw out significant portions of a law that limited the power of cities and counties to regulate the industry. The state Supreme Court voted 4-2 on Thursday to strike down portions of a 2012 law that had been crafted by Gov. Tom Corbett and his industry-friendly allies in the Legislature. This is the same Marcellus Shale where Spectra Energy had a compressor accident last spring that Andrea Grover spun. 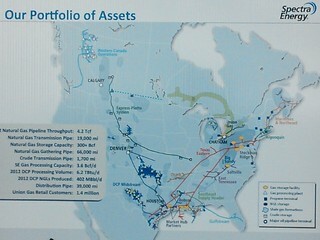 The same Marcellus Shale that is prominently visible on Our Portfolio of Assets by Spectra Energy because their Texas Eastern Pipeline goes there; the same Marcellus Shale that Spectra proposes as at least one source for the methane for the new pipelines through Alabama, Georgia, and Florida. Why does any state have a “need” to make it easier for a few big companies to profit by destroying local citizens’ land? Governments are supposed to represent the people, not corporate greed. The law restricted local municipalities’ ability to control where companies may place rigs, waste pits, pipelines and compressor and processing stations. The new zoning rules never went into effect because of a court order. A narrowly divided lower court struck them down in 2012, but Corbett appealed, saying lawmakers have clear authority to override local zoning. Among the objectionable provisions cited by the lawsuit were requirements that drilling, waste pits and pipelines be allowed in every zoning district, including residential, as long as certain buffers were observed…. The municipalities argued the zoning restrictions ran counter to objectives of protecting the environment, health and safety of people who live there, and three of the six justices agreed. A fourth justice ruled that the law violated the municipalities’ constitutional rights to due process to carry out community planning. John Smith, the lead attorney representing South Fayette and the other municipalities which brought the case, said the decision was a welcome one. Mr. Smith later issued a statement thanking the municipalities that signed up to challenge the law, which was sought by industry. Here’s attorney John Smith’s law firm, Smith Butz. Naturally there’s already an attempt by the shale gas industry to discredit attorney John Smith, with the usual sort of double standard of how can he represent local governments when he “clearly relishes opportunities to apply prejudicial terms to the industry”. Curious how such concerns never seem to apply to pro-fracking and pro-pipeline advocates who advise local governments, such as Spectra’s reps at the Lowndes County Commission recently who evaded citizen questions and were not familiar with their own company’s (poor) safety record. The Pennsylvania Supreme Court just said it’s a constitutional right for local governments to apply zoning to pipelines to project the environment, health, and safety of the people live there, and to carry out community planning. Why should local governments in Alabama, Georgia, and Florida not have the same constitutional rights? Maybe some of our local governments should start exercising those rights.